On 13-14 November weekend, my friend and i from KL were heading to Melaka to attend our colleague friend Bee Sien wedding diner. Beside wedding diner, we also went to food hunting! 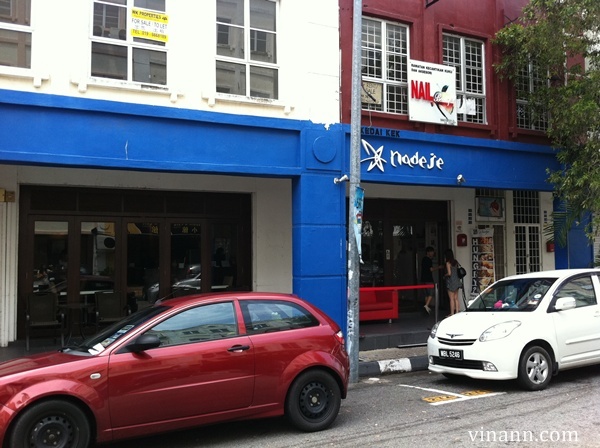 Nadeje Patisserie was brought to us by Jessie, Bee Sien's ex-colleague who living in Singapore for more than 10 years. To my surprise, when im first saw the cake, im impressed and immediately falls in love with the cake when i have my first bit. The layer cake! Im loving it! When using tea spoon to cut down the cake, i can feel the layers layers of the cake being cut through ! The Mango flavor also taste good! Im loving it man! Layer cake! 5 of us were happily enjoying the 4 layer cakes ! We all were happy boy, happy girl after having the layer cakes! Its never too late to discover the good cakes! In Dec, im going to try it again! The outlook of the shop.